Outside the Law: Stories from Guantánamo is now available to buy on DVD in PAL or NTSC formats. 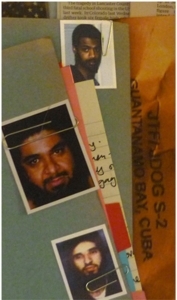 To purchase your copy through PayPal visit the Outside the Law: Stories from Guantánamo catalogue page. For more information about all other purchasing methods, please visit our distribution page. Spectacle is an independent television production company. We rely on outside funding and many of our projects are completely unfunded. If you would like to help us financially we welcome your support. Please let us know if you want your donation to go towards a specific project.